Oleocanthal, a phenolic compound found in extra virgin olive oil, has been previously indicated to carry cancer- inhibiting properties in cell culture studies. While it is known that oleocanthal has the potential to reduce the viability of certain cancers, it is unclear whether extra virgin olive oil would have the same effect. This study investigated the doses required of four different oil solutions, one oleocanthal concentrate and a control to examine cancer growth in two different cell lines. The cell lines utilized were PC3s, which are most often used to investigate advanced prostatic cancer because of their very high metastatic potential, and MDA- MB-231s, which were isolated from breast tumors and are classified as invasive ductal carcinoma. Through Western Blot and cell viability assays using cell titer glow, this study aimed to determine the concentration of oleocanthal required to kill cells, as well as the concentration of certain proteins involved in cell death via apoptosis released during arrest. This research investigated both the dose required to reduce viability of PC3 and MDA-MB-231 and the proteins present after treatment. 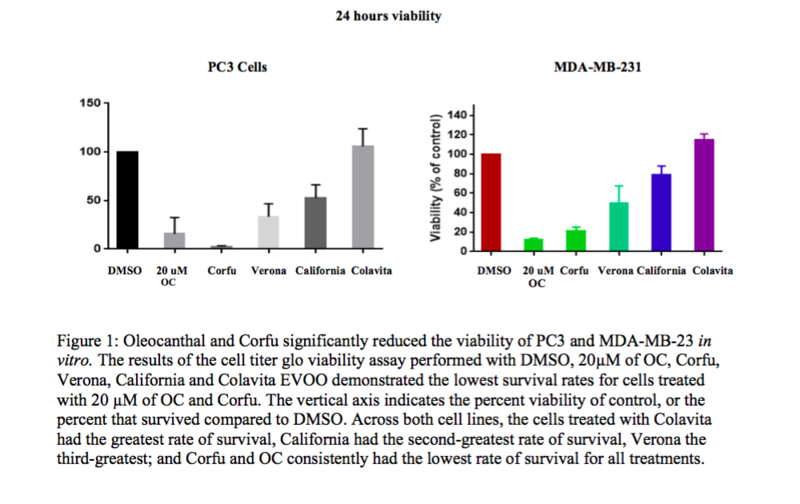 Both PC3 and MDA-MB-231 cells exhibited significant reduction in cell viability and presented with high concentrations of proteins indicating apoptosis and lysosomal membrane permeabilization after oleocanthal treatment. Extra virgin olive oil (EVOO), a key component and source of fat in the Mediterranean diet has been discovered to have many beneficial biological effects. It is a potent antioxidant, anti-inflammatory, and has been found to have similar effects to ibuprofen, as a cyclooxygenase- 1 and cyclooxygenase- 2 inhibitor. The benefits of the Mediterranean diet, popularized by the Seven Countries Study, are broad, and include improved cardiovascular health, and reduced joint-degenerative disease, neurodegenerative disease and specific cancers.The phenolic compound, oleocanthal (OC), found in EVOO has been thoroughly investigated for its antioxidant and anticancer properties. High doses of OC have been able to reduce the viability of MDA-MB-231, MCF-7 and BT-474 breast cancer cell lines by inhibiting the hepatocyte growth factor receptor (HGFR), a protein encoded by the MET gene that triggers tumor growth. Breast and prostate cancer cells treated with oleocanthal and stained for lysosomal breakage saw a significant increase in apoptosis, or programmed cell death, and necrosis, defined by cell death due to injury or disease. Additionally, signal transducer and activator of transcription 3 (STAT- 3), a transcription factor key to the development of a highly metastatic liver cancer called hepatocellular carcinoma, has been inhibited by high micromolar doses of oleocanthal in a mouse xenograft model. After treating the immunodeficient mice with oleocanthal, tumors in the lungs and liver shrunk considerably. Oleocanthal’s cancer-inhibiting abilities have been attributed to the fragility of cancer cells’ lysosomes. Previous experiments performed by Onica LeGendre and David Foster at the David A. Foster lab at Hunter College discovered a direct link between the fragility of lysosomes in cancer cells and cell death after treatment with oleocanthal. Lysosomes are of great importance to the cell and are involved in the disposal of non-functional organelles and other cellular waste.1 Damage to the lysosomes often causes death in cells. In many cancer cell lines, lysosomes were found to have weaker membranes than benign tissue cells, allowing them to be targeted by oleocanthal.1 Non-cancerous cell lines experienced cell cycle arrest due to OC but the viability of the cells was not affected by the drug.5 However, the concentration and length of exposure required for OC to kill cancer cells remains a subject of interest. Cathepsin B and cathepsin D are proteins that are upregulated in cancers. When found in high quantities in cytosol, they indicate lysosomal leakage. Cleaved PARP is an indicator of apoptosis, and was released in cell lines MDA-MB-231 and PC3 when they were treated with solutions of varying oleocanthal concentrations. These proteins were chosen based on previous research performed by the Foster lab that has linked cancer cell death caused by oleocanthal to weakened lysosomal membranes.5 The purpose of this investigation was to perform cell viability assays as well as Western Blots to determine the success of various EVOOs and a 20 μM solution of OC in permeabilizing the lysosomes of two different cancer cell lines. The cell viability assay utilized CellTiter-Glo, a method that involves adding a solution of luciferin to each well and analyzing the amount of ATP present based on the fluorescence of the cells. Western Blot utilized proteins suspended in cytosol, and involved washing with a primary and secondary antibody after electrophoresis staining on nitrocellulose paper. This project sought to determine the concentrations of oleocanthal required to kill specific cancer cell lines, and used Western Blot to analyze the proteins found when the cells were no longer viable. There were four proteins analyzed in this experiment. The first was a control, GAPDH. The second was cleaved PARP, an indicator of apoptosis. The third and fourth were cathepsin D and cathepsin B, indicators of lysosomal leakage. The cell lines used were MDA-MB-231s and PC3s, breast and prostate cancer, respectively. Both are highly metastatic, indicating a fast growth rate, therefore making them effective for cell culture. The first stage of the project was an analysis of cell viability after treatment. Six different treatment solutions were used: four kinds of EVOO, in addition to a solution of oleocanthal, and dimethyl sulfoxide (DMSO) as a control. The purpose of this step was to determine which substance was the most proficient in inhibiting cell growth. The next step was to analyze proteins present in cytosol after treatment, to determine if the cells were going through apoptosis, and if the lysosomal membranes were braking as previously thought. Experimentation began with multiple trials of a cell viability assay known as cell titer glo. This three-day experiment started with cell plating. After the cancer cells grown in a 10 cm plate reached about 80%-90% confluency, they were scraped, counted, then plated in small wells that were 6.86 mm in diameter. The second day of the experiment used the four olive oils: Corfu, Colavita, Verona, and California, as well as a solution of oleocanthal and a control, DMSO. Each was siphoned off into three different treatment tubes of decreasing ratios of solvent to media. The lowest was 10 μL: 1 mL of media, the median was 20 μL: 1 mL of media and the highest concentration was 40 μL: 1 mL of media. For the oleocanthal, the concentrations decreased from 20 μM, to 10 μM, then finally to 5 μM. Each tube was vortexed for one minute, then 100 μL of the solutions were pipetted into each well. After an incubation period of 24 hours, on the last day, 50% of the treatment media was removed, 50μL of cell titer glo was added, and the cells were analyzed for spectroscopy using a spectrometer. This allowed for a composite of data to be collected, in order to compare and contrast the qualities of each solution. For protein analysis, Western Blot was performed for the proteins, GAPDH, cleaved PARP and cathepsin B and cathepsin D. The same cell lines were used and grown for varying periods of time: 4 hours, 8 hours, 12 hours and 24 hours. The cells were treated with oleocanthal for 90 minutes. Then, the cell membranes were removed using a lysis buffer, and proteins denatured using DDT. After making the gel, the proteins were loaded onto the gel and transferred to nitrocellulose paper. After the gel was loaded, it was placed in a chamber for gel electrophoresis that organized the proteins by size. The membranes were then blocked overnight at 4 ̊C with blocking buffer, which was followed by the application of antibodies to each protein. Cathepsin B and GAPDH reacted with rabbit primary antibody and anti-rabbit secondary antibody. Cathepsin D and cleaved PARP react with mouse primary antibody and anti-mouse secondary antibody. The sample rested in the primary antibody for two hours, which was followed by three five-minute washes in TBST. Secondary antibodies were applied to the membrane for an hour at room temperature. The membranes were washed with milk to block the antibodies, then rinsed with PBS three times for five minutes, and PBS-T once for five minutes. Finally, photos were taken using a camera with high exposure to measure the strength of the protein bands. The results of the cell viability assay and the Western Blot indicate that oleocanthal is able to reduce the viability of PC3 prostate cancer cells and MDA-MB-231 breast cancer cells through lysosomal membrane permeabilization. Oleocanthal and Corfu were the most effective in reducing viability in both cell lines, which indicates that oleocanthal is effective in arresting cancer cells. However, it was demonstrated that the cells were dying as a result of destabilized lysosomes because of the proteins released during cell death. GAPDH remained constant throughout the experiment, which is to be expected as a control, and the presence of cleaved PARP indicated that the cells were going through apoptosis (figure 2). The presence of cathepsin D and cathepsin B, indicates that the oleocanthal was able to lower viability because of the weakened lysosomal membranes. These membranes were fragile enough for oleocanthal to permeate them, and lysosomes are important enough to the cells that they are unable to function without them. In figures one and two, the highest concentrations of cathepsin B and cathepsin D aligned with the treatment solutions that reduced cell viability the greatest. Additionally, the Colavita and the California olive oils were the least effective in arresting the cells (figure one). Therefore, it can be theorized that they contain a lower concentration of polyphenols such as oleocanthal. This method of targeting the enlarged lysosomes of cancer cells targets a weakness and provides a technique in which to take advantage of a biological disadvantage. This technique can be improved upon by adjusting the concentration of oleocanthal and the cell lines used during experimentation. Because the concentration of oleocanthal was most effective in inhibiting the growth of PC3 cells as opposed to the oils, it would be of interest to perform similar viability assays on different cell lines using varying concentrations of oleocanthal. It has been demonstrated in previous studies that oleocanthal is not toxic to benign cells, since the lysosomal membrane of non-cancerous cells is stronger than in malignant cells. Therefore, this strategy provides a unique therapy to effectively kill cancer cells. I would like to thank all of the members of the David A. Foster lab at Hunter College for helping me tremendously throughout my time during science research. I would specifically like to thank Dr. Foster, and my mentors Limor Goren and Matthew Utter, for whom I hold the utmost respect. They have been patient and kind in teaching me everything I have needed to know in order to be a successful science research student. Finally, I would like to thank Mr. Holzinger, Ms. Schmitz, and Ms. Machac for creating a wonderful science research community at Packer, and for inspiring young scientists like myself to pursue research and work to the best of our ability. Beauchamp G.K., Keast R.S., Morel D., Lin J., Pika J., Han Q., Lee C.H., Smith A.B., Breslin P.A. (2005). Phytochemistry: Ibuprofen-like activity in extra-virgin olive oil. Nature. ;437:45–46. doi: 10.1038/437045a. Hertog MGL, Kromhout D, Aravanis C, Blackburn H, Buzina R, Fidanza F, Giampaoli S, Jansen A, Menotti A, Nedeljkovic S, Pekkarinen M, Simic BS, Toshima H, Feskens EJM, Hollman PCH, Katan MB (1995). Flavonoid Intake and Long-term Risk of Coronary Heart Disease and Cancer in the Seven Countries Study. Arch Intern Med.;155(4):381-386. doi:10.1001/archinte.1995.00430040053006. O. (2010). Effect of oleocanthal and its derivatives on inflammatory response induced by LPS in chondrocyte cell line. Arthritis Rheum.;62:1675–1682. ONICA LEGENDRE, O., PAUL AS BRESLIN, P. A., & Foster, D. A. (2015). (-)-Oleocanthal rapidly and selectively induces cancer cell death via lysosomal membrane permeabilization. Molecular & Cellular Oncology, 2(4), e1006077. Retrieved from: http://doi.org/10.1080/23723556.2015.1006077. Pei, T., Meng, Q., Han, J., Sun, H., Li, L., Song, R., ... Liu, L. (2016). (−)-Oleocanthal inhibits growth and metastasis by blocking activation of STAT3 in human hepatocellular carcinoma. Oncotarget, 7(28), 43475–43491. Retrieved from: http://doi.org/10.18632/oncotarget.9782.